We took Ian to see Santa today. We got there when Santa was on break so there was a line. Ian was great while we waited in line. He was fasinated by the lights and wide awake until we were 2 kids away from Santa, then he fell asleep. 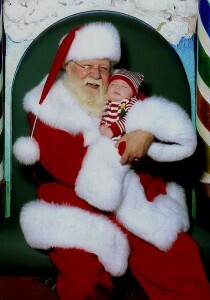 We put him in Santa’s arms and he stayed asleep, they took the picture, still sleeping. Right after the picture, he woke up. It’s ok though, it turned out pretty cute anyway. Oh, my God! That is the cutest thing ever. I must have a picture of this, if you got copies. It’s like Santa has his own little elf! Need a copy of this pic. Soooo cute.